I inadvertently started a tradition in my household some years ago. I made chocolate chip pumpkin muffins one fall Saturday morning, and suddenly my kids declared it a thing to be done every Saturday of fall. When my kids love something I’ve done for them, it’s very hard for me to say “no” to doing it again. Maybe I’m a pushover, but I do it because I realize that a day will come when they are not asking me to make pumpkin muffins for them anymore, and I’m sure I’ll miss it. So for now, pumpkin muffins they shall have. I think I’ve probably posted about these before. It’s a recipe from Vegan with a Vengeance : Over 150 Delicious, Cheap, Animal-Free Recipes That Rock*. I’ve always loved this book. It no longer jibes with my paleo ways, but it’s my kids’ favorite pumpkin muffin recipe, so I oblige. I adapted it to exclude soy milk (which we do not drink), to lower the amount of sugar, and to include chocolate chips. Preheat oven to 400F. Lightly grease a 12-muffin tin. Sift together flour, sugar, baking powder, salt, and spices. In a separate bowl, whisk together pumpkin, almond milk, oil, and molasses. Pour the wet ingredients into the dry and mix. Fold in the chocolate chips. Fill the muffin cups 2/3-full. Bake for 18-20 minutes, until a toothpick inserted into the center comes out clean. Do not try to bake bacon in the oven at the same time, or you risk burning the muffins. Trust me on this. Maybe you never try to bake bacon at the same time as anything else, but I do! Let cool for about 5 minutes. Enjoy! Preheat the oven to 350F. Line a muffin tin with baking cups. Sift together almond flour, coconut flour, baking soda, spice, and salt in a small bowl and mix to combine. Place the remaining wet ingredients in a large bowl and beat on high with a hand mixer. Pour the dry ingredients into the wet ingredients and mix till smooth. Gently mix in the dark chocolate chips and chopped pecans. Pour the batter into the prepared muffin tin, filling each cup 2/3-full. Bake for 25 minutes, until a toothpick inserted into the center of a muffin comes out clean. Let cool 5 minutes. Enjoy! Danielle Walker doesn’t mention anything about sifting the almond and coconut flour, but I have found it absolutely essential to creating a better muffin. Otherwise they seem to turn out a bit grainy. However, I’m getting ready to order a superfine almond flour (this one:Honeyville Blanched Almond Flour Super Fine Grind Gluten Free Cholesterol Free albs)* and I’ll see if it makes a sifter unnecessary. 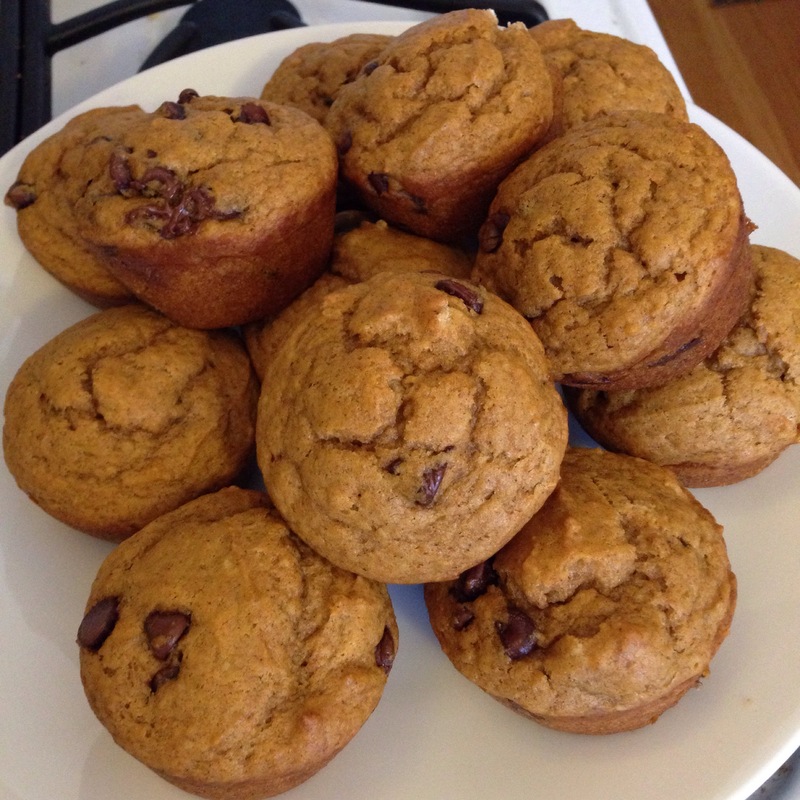 These aren’t as pretty as non-paleo muffins, but they are moist and delicious. I serve them with a pat of grass-fed butter and a cup of hot spiced tea. Perfect for fall. So, that’s our Saturday breakfast tradition. And it is our Sunday breakfast tradition, too – the recipes make enough that there are plenty of muffins to heat up before church on Sunday (and I put a tray of bacon into the oven to bake while we get ready, because baked bacon – that’s how I roll!). How about you? 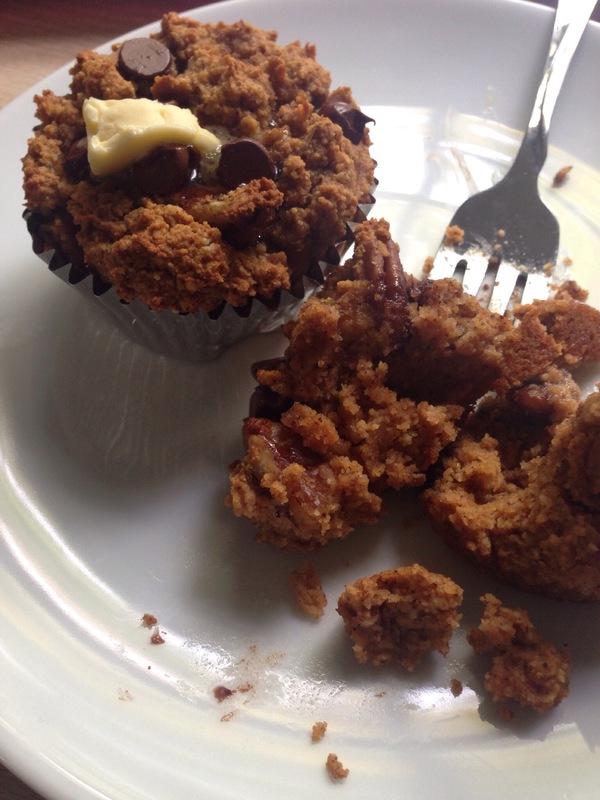 Do you have any favorite paleo muffin recipes? It will soon be winter, and when that happens, my boys will no longer expect pumpkin muffins every weekend. So I’m looking for some wintry ideas! Those look really worthy of being begged for, and surprising memories are made in those little things. I am not paleo, but bake quite a lot. I’d try that same muffin but sub near death mashed bananas for both the pumpkin and syrup and see how that works. I suppose it’s possible you might want to retain a tad of the syrup for moisture depending on the bananas. Hope you find something for a winter tradition, winter needs all the help it can get.